We did this ride only just over a year ago, but it was quite popular, so I have suggested revisiting it to fill a gap in our schedule. It features some of my favourite cycling territory, namely the lanes to the north-east of Ringmer – Norlington Lane, Green Lane, Harveys Lane, Bradford’s Lane – and the lanes around Ripe: Mill Lane, Mark Cross Lane, Langtye Lane. Nice and flat, narrow and quiet, give or take the odd horse. We start from Lewes Station. As last time, my brief history of Lewes Station is available if anyone wants it. If not too muddy, we can also go via the Lewes Railway Land Nature Reserve at the start of the ride. Once again we will sample the delights of Palehouse Common and Hollow Lane, and the latter may once again inspire a reading of T S Eliot. Our lunch stop, the King’s Head in the delightful little Sussex village of East Hoathly is just over half way through and we should arrive there at about 1pm. Once more, a semi-traverse of Vert Wood if not too muddy, then into that lovely flat, open countryside to the north of the Downs (Laughton Levels?) and so to Berwick Station. Start at Lewes Station at 09:40. Trains: Get the 09:17 train from Brighton to Lewes. Duration: 6 hours including lunch and cat herding. Getting back: Trains leave Berwick hourly for Brighton at 40 minutes past the hour. Terrain: Flat – we never go above the 75m contour, and any “climbs” we might encounter are gentle ones. There is a very short section of the B2192, but otherwise quiet lanes and a reasonably hard track through Vert Wood. This is a linear ride; anyone arriving by car can park at Lewes Station and get the train back there from Berwick; or park at Berwick and get the train to Lewes. Awoke at 7.30 to hear the rain teaming down the window “Oh no did I really have to get up and prepare for a bike ride”… But duty and optimism won the day and by 10.15 the rain had stopped, we had bought tickets at the station and were greeting our faithful Clarionistas :- Julian, Richard S, and Richard C. There was the further pleasure of seeing Sue Priest and Chris Smith from Lewes spin into sight at Lewes car park. Onward then through the cobbles of Cliff Walk and on to cycle route 90 alongside the A27 (but with reassuring spacing from the road and a good smooth surface). Up Ranscombe Lane to Glynde via what some would call undulations (and other hills…) , but everyone managed very well. At St. Mary’s church Chris gave a very erudite run though the history of the church and the Glynde area – too much to put here but Chris will surely oblige with information if contacted. 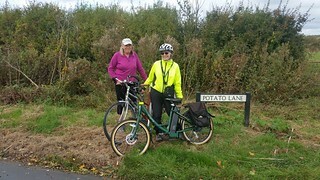 By this time the wind had turned to something more like a gentle following breeze and we descended from Lacys’ to Moor lane, a lovely quiet lane and on to Potato Lane, a lined avenue of trees with a wonderful view of a large wind turbine on the hill. Through the village of Ringer to lunch at the Anchor where we found excellent food and good service. True, the food took some time to arrive, but that allowed for much discussion. By this time I (Joyce) had been persuaded into doing the report. The first stage of the discussion I threatened to call “oldies reminiscing”, as the tone was set by Leon declaring how “they don’t make ale like they used to” – although he did say the one he was drinking was an exception. From then the conversation ranged through childhood experiences: – memorable teachers, fishing with hemp seeds, various travel experiences, the Miners’ strike and historical political tales (we enjoyed Chris’s one about the Islington goats …). Things were seriously brought up to date though in the later and longest discussion which involved (as it had to) Brexit, The future of the Labour Party, The Progressive Alliance, Proportional Representation and of course Marmalade face was mentioned. 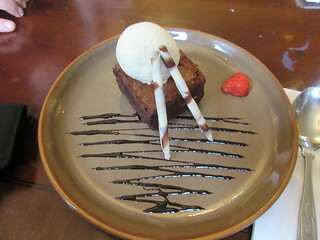 With all that we were finally served with delicious food, so satiated by our first course that only Julian had room for a chocolate brownie with ice cream. The rest of us contented ourselves with coffee and a small piece of chocolate. Our return was in keeping with our now very relaxed bodies – a run down the straight smooth cycle way through to Mill Lane into Lewes. Who should we run into but our good friend and Clarion member John Clinton who had the week before completed the Coast to Coast cycle run. 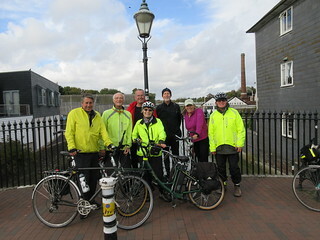 Our final stop was on the river bridge for the group photo and then farewell to Chris and Sue and to our trains. I love those lanes to the north-east of Ringmer – Norlington Lane, Green Lane, Harveys Lane, Bradford’s Lane – and the lanes around Ripe: Mill Lane, Mark Cross Lane, Langtye Lane. Nice and flat, narrow and quiet, give or take the odd horse. On previous rides we’ve tended to turn west after the fox statue, and make for Isfield. Maybe that is what Sue has in mind for her ride on June 26th; but we will venture eastwards today, and take in the delights of Palehouse Common and Hollow Lane (which might bring to mind a certain poem by T S Eliot …) before arriving at our lunch stop, the King’s Head in the delightful little Sussex village of East Hoathly which, in true Sussex tradition (think of the Grinsteads and Chiltingtons) is nowhere near West Hoathly. A semi-traverse of Vert Wood if not too muddy, then into that lovely flat, open countryside to the north of the Downs (Laughton Levels?) and so to Berwick Station. Start at Lewes Station at 09:30. Trains: Get the 09:12 Bexhill train from Brighton to Lewes. It will probably be an electric train with plenty of space for bikes, as the maggots are resting today. On arrival in Lewes, remain on Platform 3 for a quick look at the latest railway history poster, and a game of guess-what-they-left-out. Then an optional repeat of my brief history of Lewes Station if anyone wants it. Getting back: Trains leave Berwick hourly for Brighton at 40 minutes past the hour. If we arrive at the wrong time, the Berwick Inn has a bouncy castle we can play on. Terrain: Flat – we never go above the 75m contour, and any “climbs” we might encounter are gentle ones. There is a very short section of the B2192, but otherwise quiet lanes and a reasonably hard track through Vert Wood. If not too muddy, we can also go via the Lewes Railway Land Nature Reserve at the start of the ride.